So, you’ve acquired your dream mobile playground – your RV. We’re sure you can’t wait to get on the road and have the best getaway. One downside to RVing is that, you will have to regularly drain the waste in your RV’s holding tanks into a campground sewage system. For this, you will require an RV sewer hose, and not just any other RV sewer hose, mind you, but the best RV sewer hose you could find. Why? Well, have you seen the movie RV? No? There’s a particular scene that probably trumps up all horror RV stories: a nasty, explosive poop fountain. So, yes, that’s definitely something you don’t want to happen to you especially on your maiden voyage. So before you start planning to drive away to the Grand Canyon, let’s get down to the dirty basics first – the part where you need to dispose all the waste products in your RV. As an RVer out to get the most out of your home-on-wheels for years to come and have the comforts of home wherever you go, it is in your best interest that you buy only the top RV sewer hoses. When traveling on an RV, you don’t have a lot of extra storage space, so carrying a backup is usually an impractical, if not impossible, option. That’s why it’s important to have just one sewer hose that does the job the way you like it. Also, you don’t want to spend a huge part of your time draining sewage from your RV, so a sewer hose that gets the work done efficiently in a shorter amount of time is your best bet. What’s the best sewer hose for RV? If you’ve come to us looking for tips on how to zero in on the right sewer hose for your RV needs, you’ve come to the right place. 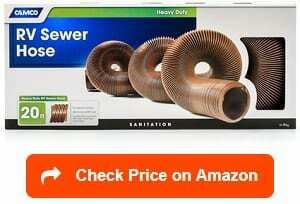 Here, we provide reviews of the top RV sewer hose in the market today to help you make an informed decision. So, are you ready? Let’s dive right in. 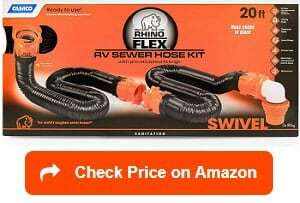 If you’re looking for the toughest RV sewer hose you can buy, you can never go wrong with the ready-to-use Camco’s RhinoFlex 20-foot RV Sewer Hose Kit. The kit includes two 10-foot collapsible hoses made of sturdy material (polyolefin). The hoses are reinforced with steel wire. It features lug fittings and four-pronged bayonet fittings plus locking rings to ensure a more secure setup. The translucent elbow with a 4-in-1 adapter easily allows you to see what’s passing into the hose. It comes with four storage caps. The two 10-foot collapsible hose assemblies allow you to use only as much hose as you need. What I like about this product is that it allows you to easily switch from using a 10-foot hose to a 20-foot hose to suit the occasion. Also, after you set it up, the hose is able to easily maintain its shape and stay put. Another thing I like about this sewer hose kit is that once you’re done draining your sewer tanks, you can easily collapse the hoses, put the storage caps on, and stow away the hoses into a 4-inch square bumpers. The RhinoFlex easily retracts, each section can compress into 39 inches, so once the 4-in-1 adapter is removed, you can easily squeeze the hoses into a small space. If you want to replace the hose, you can simply detach the locking rings and swivel fittings and reuse on a new hose. What I don’t like about this product is that it’s not crush resistant. Also, the fittings may suddenly loosen because they are not permanent attached. You may have noticed by now that this list is quite partial to Camco products. That’s because they are known throughout the RV community as the most durable sewer hoses in the world. 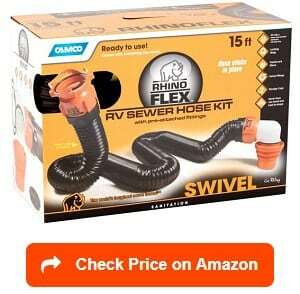 The Camco RhinoFLEX Sewer Hose Kit definitely doesn’t disappoint. It provides a reliable connection between your RV and the external sewage system. It comes equipped with a collapsible sewer hose made of the sturdy polyolefin and is reinforced with steel wire. This steel wire reinforcement helps prevent major damage to the hose and ensures that the hose remains extended to your desired length. This feature i what I like best about this product because you only have to use as much hose as you need. There’s a translucent elbow with a detachable 4-in-1 adapter to fit into any standard sewer connections. It has swivel fittings and reusable locking rings that can be used with a new RhinoFlex hose. The kit also includes storage caps. The hose can be compressed and the 4-in-1 adapter removed so you can store it in standard square tube bumpers. What I don’t like about this product is that the fittings may come loose if the ends are not securely fastened. 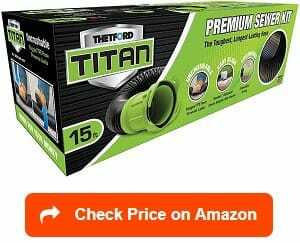 The Thetford Titan has got to be one of the best RV sewer hose kits for the enthusiastic RVer. This innovative sewer hose is made of the sturdy Thermal Plastic Elastomer (TPE) that makes it resistant to punctures and abrasion. The 15-foot rugged hose can easily be hooked up to the RV and to each other. The hose is uncrushable, easily snapping back into place when stepped on or run over by a car. This versatile sewer hose has an Extended Grip universal bayonet mount, so you can easily mount it on any RV waste outlet. The kit comes with an innovative 5-in-1 universal adapter with an ergonomic handle and two secure end caps. Extremely well put together and highly versatile, the Thetford Titan sewer hose works well even in extreme temperatures. What I don’t like about this product is that the thick hose can be difficult to collapse and store away. 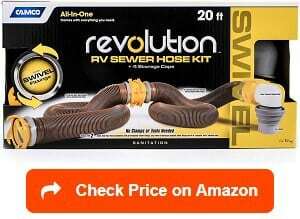 The Camco Revolution 20ft Sewer ready-to-use hose kit comes with 360-degree swivel fittings for easy hookup and two 10-feet hose assemblies. What impresses me about this product is that these hoses are made of HTS vinyl which makes them super heavy duty and perfect for fulltime RVers. That plus the fact that the fittings seal really tight and you can never go wrong with the Revolution. The kit includes bayonet style-fittings and lug fittings, a detachable translucent elbow so you can see when your tank is fully empty, and a 4-in-1 adapter to fit any standard sewer connection which eliminates the need for weights to keep the hose in place. Should you want to replace your hose, simply detach the swivel fittings and use it on the new hose with the use of a clamp. Another thing I like about it is that the hose and fittings can compress to approximately 2 feet for easy storage. Once the adapter is removed, the hose can easily be stored in standard 4-inch square bumpers. What I don’t like about the Camco Revolution is that it is heavier than most sewer hoses so retracting it is a challenge. You can’t have a list of top choices for your RV sewer hose without mentioning the Valterra DO4-0275 20 Feet Denominator Sewer Hose Kit. 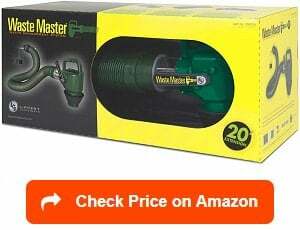 This heavyweight offers two 10-feet hoses that you can use together or separately. The hoses are 23-mil thick and equipped with rotating fittings that easily allows your RV to be hooked up to the external sewage inlet. It comes with a 90-degree universal sewer adapter than can fit into any standard sewage system. The UV stabilized poly construction ensures that the hoses are protected from leaks. They are also so versatile that they can be used even in freezing temperatures. When expanded, the hoses don’t wiggle like and just stay put unlike some sewer hoses in the market. Come storage time, they then easily retract and collapse to the original length. The clear elbow connector allows you to see liquid flowing out of your sewer tanks into the ground sewage. A clear elbow is something I really like in a sewer hose. It’s not because I’m fond of watching sewage matter, but it’s because I want to see that the passing liquid from my tanks is clear so that I know that they have been flushed clean and that my job is done. Very sturdy, the Valterra Denominator won’t break even when you accidentally step on it or put a heavy object over it. 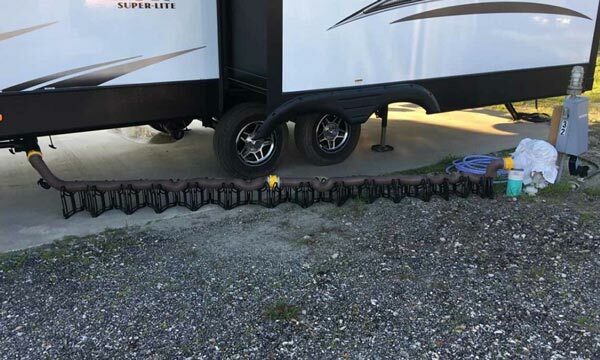 Many users have reported that when maintained properly, this sewer hose can last a very long time even for RVers who are out on the road every single day. What I don’t like about this product is that the design of the hose makes it harder to clean. The Camco RhinoEXTREME sewer hose is triple wired with TPE vinyl, making it ultra-strong to withstand extreme conditions, but at the same time flexible. Its superior sturdy material ensures that it will not rust or crush. And that’s what I like best about the RhinoExtreme. You can step or drive over it, and it will snap back to its original shape. It’s no wonder that this sewer hose is a favorite in the RV community because it does not tear or rip with normal usage. The ready-to-use kit comes with a two 10-foot hose sections that boast some of good RV sewer hose fittings on the planet. It has pre-attached Rhino swivel bayonet and lug fittings, and translucent elbow with 4-in-1 dump station fitting, reusable locking rings, and storage caps for each end. With its 4-in-1 adapter, the RhinoExtreme can fit into any sewer connection. You won’t need any additional connection devices or weights other than this adapter. What I don’t like about this sewer hose is that the hoses are stiff, so it can’t squeeze into the standard 4-inch square bumpers even with the 4-in-1 adapter removed. The Lippert Waste Master is an absolute joy to use and is definitely one of top rated RV sewer hose kits you’ll ever find. The kit comes with a time-tested CAM lock connector that guarantees no leaks from your RV to the ground sewage system. The leak-proof CAM lock fittings is what I really like about this RV waste master system because, compared to the nub and twist type, it can withstand rigors of abuse. The CAM lock is an industry standard used in the liquid transportation industry. It’s possible that in the years you have been RVing, you have never encountered a sewer hose this tough. The Lippert sewer hose may be the last sewer hose you will ever purchase. 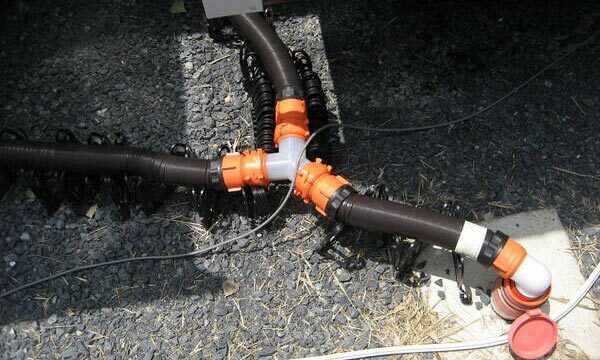 It’s a puncture-resistant hose designed to work even in the roughest terrain and intense climate conditions, making it an ideal RV buddy for a stress-free sewage management system. The clear view port allows you to see if the water coming out is clean which means that your tanks have been flushed clean. The 90-degree discharge port makes it easy to position and attach to any sewage inlet. The permanently attached tapered nozzle has a handle that is easy to grip and an integrated shut-off valve that ensures total closure. When compressed, the hose is 5 feet and 6 inches long. It stays in place after being extended to reach 20 feet. Unlike traditional hose interiors which tend to trap debris, the Lippert Waste Master has a smooth interior that prevents waste from getting trapped. This feature also makes it a breeze to clean the hose, so can be on the road in due time. The Lippert Waste Master requires one-time installation. The cam lock mechanism has to be mounted at the end of your RV’s drain pipe. What I don’t like about this product is that the large and permanently attached fittings may make storing the hose difficult. That’s a rather small negative for an otherwise excellent product, so if you don’t mind bulky sewer hoses, then go ahead and buy the Lipper Waste Master. The Camco RhinoFLEX Tote Tank Sewer Hose is a 3-foot collapsible hose that allows for a secure, no-mess way to use your portable tote tank. What I really like about this product is that it is easy to install, connects very well, and does exactly what it’s supposed to do. 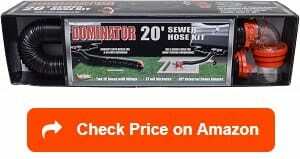 The Camco RhinoFLEX sewer hose kit comes with bayonet ends on the 90-degree elbow that attach to any lug fitting. With each end featuring four bayonet prongs, the elbow has superior lock capabilities. Made from UV stabilized resin, the translucent elbow is designed to work well even after many years of use. The steel wire reinforced RhinoFLEX RV sewer hose extension is made of sturdy polyolefin material. It is collapsible so you only need to use as much hose length as you need. The hose can retain its shape when bent and is fitted with lock rings and storage caps, making it convenient for storage. Another thing I like about the Camco RhinoFLEX Tote Tank Sewer Hose is that it allows the black and grey water to flow easily into your portable sewage tank. If you have a portable sewage tank and don’t have a short sewer hose, we suggest you get yourself a Camco RhinoFLEX sewer hose because it does an awesome job, no mess and no smell. What I don’t like about this product is that the length of the hose is a little bit short to do an even better job than it already does. Camco 39631 RV HTS Heavy-Duty Sewer Hose is one very tough cookie that makes a perfect value-for-money RV sewer hose. It is designed to work for a long time and works exactly as advertised. What I like about this product is that it is much sturdier than most regular sewer hoses, and you get a pretty good product that does the job for half the price of similar sewer hoses in the market. The hose is a 15-mil of HTS vinyl which reaches up to 20 feet when fully expanded, yet compresses to a mere 32 inches when retracted. RVers who are not fond of the ones with built-on connections will love this inexpensive yet heavy-duty sewer hose. Ideal for seasonal RVers who like to go on weekend trips when it’s camping season, the 3-inch in diameter Camco 39631 RV HTS becomes sturdier when collapsed, but not fully rigid. What I don’t like about this Camco sewer hose is that putting the connectors can take some time. Also, after repeated use, the plastic can become brittle. Overall, while the Camco 39631 sewer hose is great for occasional camping trips, it lacks the more stress-free and durable features that fulltime RVers can’t do without. Whenever you drain the sewer tanks of your mobile home, you usually need a pipe that has a 90-degree bend to work on a downhill or uphill terrain. The Camco Sidewinder RV Sewer Hose Support works perfectly for this purpose. Made of sturdy yet lightweight plastic material, the Camco Sidewinder RV Sewer Hose Support is equipped with durable snap-fit hinges. The deep cradles hold your sewer hose in place without the need for straps. What I like about this product is that it keeps the hose off the ground, preventing it from getting pin holes and abrasions. By cradling the sewer hose and preventing potential damage to it, the Camco Sidewinder makes the life of even the most durable sewer hoses even longer. 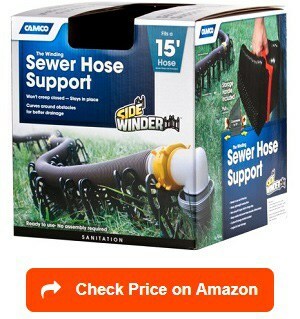 Also, Camco SideWinder Sewer Hose Support ensures that your hose drains totally before you store it. It enables the hose to easily navigate obstacles, and the weather-proof sturdy frame is flexible enough to use even in frigid temperatures. Another thing I really dig about this sewer hose support is that it practically doesn’t require assembly. It is ready to use straight out of the box. For many RVers who don’t like complicated setups, this one is definitely a winner. That said, the hinges are rather flimsy, and sooner or later they may break eventually, so that’s one thing I don’t like about the Camco Sidewinder. Now that you have glimpsed the best features of top RV sewer hoses in the market, let’s discuss the nitty-gritties of using an RV sewer hose, like what certain considerations you must have when buying a hose, and how to install, clean, and store your RV sewer hose. I also prepared some answers to frequently asked questions about RV sewer hose. So this RV hose 101 practically gives you everything you need to help you make the best decision when buying one. The following are important considerations when buying an RV sewer hose. You may narrow down your choices by deciding if you want an all-around hose or a traditional hose. Also, you need to consider your budget. How long do you want your sewer hose to be? RV sewer hoses are available in various materials, lengths and thickness. There are kits that are 14-20 feet long with an accompanying extension hose of varied lengths. Most RVers settle for a 15-feet long hose, but if you want it longer, then that is up to you. Many veteran RVers carry two lengths of sewer hose to suit varying distances between the RV and the external sewage system. How often are you going to use your RV? If you intend to go on frequent road trips using your RV, you might want to settle on a durable, heavy-duty sewer hose. It’s quite more expensive than a standard hose, but you can rest assured it will stand the test of numerous trips. However, if you only intend to use your RV only occasionally, a regular sewer hose would be just fine. Will the hose be able to withstand constant pulling and stretching? You want your RV sewer hose to be flexible enough to extend from your RV to the sewage location without tearing or breaking. Will the hose allow continuous flow? Make sure the hose is big enough to allow the passage of any kind of waste material. Can the hose be easily stored? You want a sewer hose that is easy to collapse and be able to fit in easily into its designated storage area. What is an RV sewer hose? The sewer hose is used flush the waste matter out of your vehicle and safely dump it into a sewage system. Emptying your RV’s sewer tanks has to be handled with care because, trust us, you don’t want to have messy accidents (remember the movie RV?) while doing it. How does an RV sewer hose work? An RV sewer hose is the hose, which is primarily used for drainage within an RV. It works by acting as a pipe system when it comes to flushing the waste from your RV into an external sewage system. It is a vital piece of equipment for RVs, as it helps clean dirty water and removes waste materials from your vehicle each time you go camping. With the help of this sewer hose, observing proper hygiene will be easier. It also gives you some sort of assurance that your RV or camper will not smell. For your RV sewer hose to work, it connects your toilet’s flush into an external sewage system. Each time you need to dispose of waste, you just need to connect the sewer hose to the primary sewers. This means that you no longer have to dispose of the waste manually in the ground or river. The hose makes your RV more comfortable and hygienic as it provides an inexpensive and dependable solution in draining and removing unwanted wastes. Just make sure that you look for a high-quality sewer hose. It would be best to assess the length of the hose carefully as well as the usage frequency. You also need to check and consider some elements that can guarantee its stability. Once you have installed the sewer hose, proper care should also be given to it. This is important to prevent it from getting contaminated or acquiring rust due to its exposure to the elements, such as rain. Cleaning the sewer regularly is also necessary. What are the benefits of using an RV sewer hose? Basically, you need a sewer hose to safely remove the accumulated sewage from your RV’s holding tanks where the water from your toilet and kitchen is deposited. This needs to be drained and transferred to the campground’s sewage system. Having a good and sanitary trailer sewage disposal system is one way to ensure that you fully enjoy your RV dwelling. What are the different types of RV sewer hoses? An RV sewer hose is usually categorized based on its length. This is the main reason why you have to carefully consider the length of the hose when you are still in the selection process. Also, take note that sewer hoses feature different models based on either their width or length. Choosing the right type of sewer hose for your RV based on length will actually be dependent on your preference. It is mainly because you will be the one who will judge the distance in between your RV’s position and the external sewage’s position. However, the most recommended length is usually around 15 feet. Also, take note that choosing the right type of sewer hose will let you get exposed to kits of various sizes, usually around 15 to 20 feet long. You can also invest in extension hoses that have various lengths. This means that while the typical type of RV hose is around 15 feet, you can still extend it by using an extension hose if necessary. Aside from the length and width, the types of RV sewer hose can also be categorized based on the materials used. The most common material used in making a sewer hose is vinyl. Make sure that you get a vinyl hose, which is extra durable, though, to increase its chances of serving its purpose for quite a long time. RV sewer hoses are also distinguished based on whether they are collapsible or not. If you want a more convenient hose, then go for the collapsible type. It is convenient because it promotes ease in storing it, especially when you are no longer driving your recreational vehicle. Aside from that, you can also shorten the collapsible sewer hose if necessary so it can fit your specific needs. It is a nice feature so you have to consider this when searching for the right type of sewer hose for your RV. 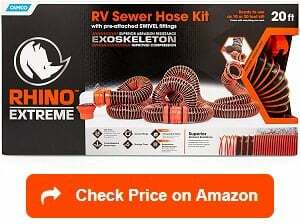 How long can an RV sewer hose be? When you buy a sewer hose for your RV, you can choose among different lengths, thickness, and type of material. Hoses may be from 15 feet to 20 feet long, so the choice is yours as to which length you think will serve the purpose for your RV. The minimum appropriate length is 15 feet, but to be on the practical side as you may need a longer one in the future, why not just opt for a 20-feet long hose? Majority in the RV community think that it’s the best RV sewer hose length. What RV sewer hose accessories do I need? Most RVers find dumping RV sewage properly a tedious chore. Indeed it is not an easy task, but having the appropriate accessories can make it a lot easier. Below is a list of the things you will need when you use your sewer hose. Latex gloves. You don’t want to handle sewage stuff with your bare hands, so using latex gloves is a must. You may also use plastic gloves, but latex gloves are the best. Make sure to choose one that is thick and durable enough so it doesn’t tear or break easily. Sewer hose supports. Hose supports cradle the hose and keep it off the ground. It’s a good way to protect your sewer house and make the waste disposal process easier. The sewer hose supports prevent slipping and tipping. The tapered height as the hose gets nearer the sewage system prevents pooling of water in your hose during the drainage process, as well as leftover waste matter when you detach the hose. Clear Sewer Hose Adapter. Some may prefer not seeing what comes out of the black tanks, but if you really want to be 100% sure that the thanks are clean, you will definitely find the clear sewer hose adapter handy. This inexpensive item removes the guesswork out of your dumping process because it allows you to see when the tanks are empty and everything is out before you disconnect the pipe. Flushing hose. This hose is used for the purpose of flushing your tank or sewer hose. You can use a garden hose variety for this purpose as long as you don’t use it for anything else. You want a different hose for your sewage stuff at all times. Macerating system. Essentially, a macerator is a motorized grinder similar to a waste disposal unit used at homes. Macerators help turn solid was the matter into a slurry, making it less possible for the smells to escape while the waste is being disposed. Macerators make it easier to dispose of your RV waste anywhere where it is allowed when a proper camp sewage system is not available. With macerators, RVers can pump the waste even up an incline. How to install an RV sewer hose? The majority of RV sewer hoses today are made using a coil wire as well as a vinyl or plastic wrap, which varies in terms of thickness. You have an assurance that the hose is capable of holding up if the wrap is thicker than normal. In most cases, the hose can be set up if you install a hose fitting at the end. If you have a difficult time installing this fitting then consider investing in a hose, which features a sizing ring. This promotes ease in installing the fittings. It is also possible for you to invest in threaded fittings designed to produce a leak-free connection when you tighten the hose. In terms of hooking up and using your RV sewer hose, it pays to make use of disposable gloves as you will need to handle gross grey water that comes from your sink and shower as well as raw sewage from the toilet in your RV. Once you put the gloves on, check whether the valves of the sewer hose are closed. You need to ensure that all the valves are shut prior to removing them. The next thing to do is to connect the sewer hose. Most of these hoses for RVs feature bayonet-style fittings that help in formulating a tighter seal. What you have to do is to connect one of the sides into the waste fitting for your RV then extend the hose to the inlet of the dump station. Open the sewer hose valve of the black tank slowly. There might be a pressure surge while the sewage gets into the hose and moves into the dump station. Let the tank drain completely. Once done, you can close the valve. The next step is draining the grey tank by slowly opening its valve. Such a step is necessary for cleaning the raw sewage in the hose. Let it drain completely. You should then close the valves of the sewer hose. Check for leaks during this process. If there are no leaks then you can disconnect the hose from your recreational vehicle. Spray down within the hose and the concrete surrounding the dump station. The next step involved in properly hooking up and using your RV sewer hose is to stow it away. Make sure that it is not in contact with the other stuff stored in its storage area. Lastly, disinfect. Throw away your gloves and use a hand sanitizer to disinfect. It is also necessary to spray some disinfectant on the hose connections and sewer valves. 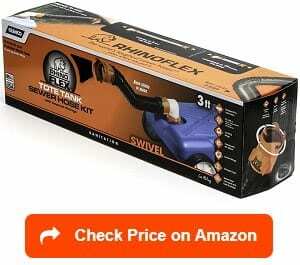 How to shorten an RV sewer hose? Shortening an RV sewer hose is actually possible. Everyone knows how annoying it is to have an extremely long hose. It is a bit inconvenient to use. One that is too short, on the other hand, can create a total mess once you start using it. In this case, it would be best to go for a sewer hose, which is a bit long. However, if you feel like it is too long for your liking in the sense that it is already annoying to use, you can trim it down. After cutting it to your desired size, you should get rid of the parts within the end of the portion you cut. You should then make use of some form of solvent to glue or stick together the shorter hose within the other end. You can also cut one section from the middle then utilize a coupler together with the solvent over it as a means of securing the two ends. To prevent the hassle of shortening the sewer hose, though, you need to be very careful during the selection process. You should primarily look into the hose’s length when you are still shopping for the right one. Ensure that it is long enough to suit most of the needs of your recreational vehicle. The majority of sewer hoses actually come in 15-feet and 20-feet options, so pick one that perfectly suits your need. If you are still unsure what length to choose, you can always consult the owner’s manual of your vehicle so you can figure out the ideal length that it needs. How to keep an RV sewer hose from freezing? The majority of recreational vehicles today are not designed to handle freezing temperatures. They will not be able to handle icy and snowy climate. With that in mind, it is necessary to take precautionary measures to ensure everything in your RV does not get frozen during an extremely cold weather. Disconnect the hose – You have to detach it from where you connected it in your RV. Put it in a covered spot, which does not expose it from extreme cold. Putting a heating pad over the water pump in your recreational vehicle can also help. Lay a few towels on the pump, too, as doing such can insulate it from the cold weather in case there is no available electric supply. Insulate the hose – Providing proper insulation to the RV water hose can also prevent it from freezing. What you have to do is to buy a heat tape first. This tape is recommended as it has a thermostat and heating element that can help warm the sewer hose. It also prevents water from coming out of the hose in case you plug it to a typical electrical outlet. Wrap the heat tape around the hose using the barbershop pole fashion. The heating element should be left hanging off on an end of the sewer hose. The next step involves using foam insulation tubes as a means of covering the tape. Such tubes are designed in such a way that they can wrap the water lines. Make sure that the foam insulation tubes perfectly match the hose’s length. They should be able to cover the whole length of the hose. Wrap it around the hose. Lastly, get a duct tape and use it to wrap into the insulated hose. This can help ensure that the foam tubing will be secured around the tape. Aside from the mentioned tips, it is also necessary to rinse the sewer hose regularly and stow it in case you are not using it. Doing such tips will prevent its possible damage. Also, take note that it would be better to go for a permanent ridged pipe if you wish to connect it outside 24 hours a day. How to use (connect) RV sewer hose? It is never fun to dump your RV waste, and if there’s one thing RVers would like to do without, this is definitely it! However, while it’s never fun, you can make the dumping process less tedious and time consuming by knowing how to use the sewer hose correctly. Here, we share the tips on properly connecting and disconnecting your RV sewer hose. Make sure the RV sewer valves are closed before you take off the cap. Miss this step and you’re in for a nasty surprise. 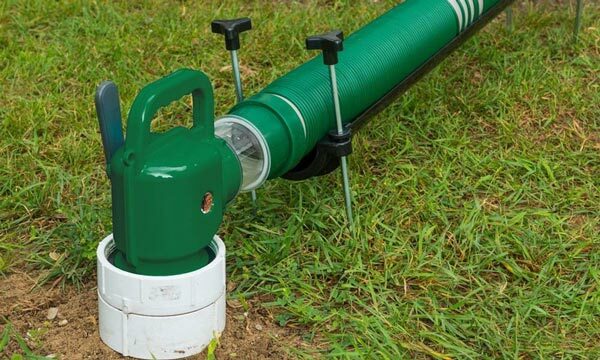 Attach the sewer hose to the RV waste fitting and connect the other end of the hose to the ground sewer inlet. Make sure both ends of the sewer hose are securely fastened. Slowly open the black tank hose valve (always make sure you drain the black tank first before the grey one) and let the contents empty into the ground sewer. Make sure the black tank is completely drained, then close the valve. Watch out for any leakage. Slowly open the grey tank hose valve and fully drain the tank. By doing the black tank first before the grey tank, all the sewage residues are drained out from the hose. Make sure there is no leakage as the tank is being drained. Close the valve. When you’re done draining both tanks, close the valves of the RV sewer hose. Detach the sewer hose on the RV side and replace the cap. Then, gather the hose and walk to the ground sewer. Don’t disconnect the hose from the sewer inlet yet. Using a non-potable water hose, spray the inside of your sewer hose to clean it. Also spray down the surrounding area of the ground sewer. Disconnect the sewer hose from the ground sewer inlet and replace the cap. Store away your sewer hose in the designated storage area. How to clean RV sewer hose? Grey tank water contains water from your RV shower and kitchen, while water from the blank tank contains human waste (toilet water). By draining the black tank first before the grey tank helps flush out waste residue inside the sewer hose. Flushing the hose with water after you’ve dumped your RV waste also ensures it stays clean. How to store RV sewer hose? Proper handling and storage of your sewer hose increases its longevity. Make sure to stow away your sewer hose in an enclosed box in its proper designated area in your RV. This prevents the potential spread of waste matter or diseases. The sewer hose and the drinking hose must be kept separate from each other at all times. Storing them in the same compartment increases the risk of cross-contamination. Camco Revolution vs. RhinoFlex: What’s the difference? Bearing the Camco name which is known in the RV community as a top-notch brand, the Camco Revolution and the Camco RhinoFlex are two of the most preferred sewer hoses in the market today. But what’s the difference between them? Both are made of tough materials and store easily, but the Revolution, which is a little on the expensive side, has more sophisticated and heavy-duty features than the RhinoFlex. Camco Revolution hoses have the ability to spin 360 degrees, making it easier to tighten connections. The Revolution sewer kit also includes a 4-in-1 adapter that will fit any standard sewer connection. The RhinoFlex is a standard heavy-duty polyolefin sewer hose reinforced with steel wire. It is not as high quality as the Camco Revolution, but it is inexpensive, so it’s more suited for budget-conscious, seasonal RVers. Between the two, the Revolution ensures better drainage at all times. It is ideal for the more experienced RVers going on longer trips. How to repair an RV sewer hose? Despite the fact that most RV sewer hoses today are constructed with durability in mind, you can’t still expect them to last forever. Your chosen sewer hose will eventually fail to perform its function after using it for quite some time. The good news is that you can repair an RV sewer hose with the aid of simple steps. The first step involves rinsing the sewer hose well. Cut the damaged end with the help of a box cutter. Get a wire cutter and use this to clip the slinky coil in the interior, which tends to stick out of the end that you have just cut. The next step is to use your screwdriver in unscrewing the retainer clip. This step is important in removing the bayonet fitting found at the specific hose’s end that you cut off. You should then insert the fitting again into the end of the hose, which has been newly cut. Connect the retainer ring. After ensuring that the ends of the retainer ring seat firmly in the retainer clip grooves, you have to secure it. You can do that by holding the sewer hose in place then using your screwdriver as a means of securing the ring. Now that we’ve let you in on what makes a sewer hose a great product, gave reviews of the best RV sewer hoses in the market today, as well as answered the most frequently asked questions about RV sewage management, you are well on your way to RVing like a pro. Make sure to pay attention to each product’s key features before you buy an RV sewer hose. Also, make sure to consider the pros and cons so you will have realistic expectations about the product. We hope that by presenting you this guide that includes reviews of the top choices for RV sewer hose, you will be able to make an informed decision that will help make your RV trips truly enjoyable and hassle-free. We would like to thank you for reading this article. Find out more about how to choose the best RV macerator pumps, best RV toilet papers and best RV toilets with our reviews and ratings. Furthermore, please take a look at the best RV portable waste tanks and best RV holding tank treatments to choose the best one for your RV waste water and sanitation. Camco rhinoflex and rhinoflex extreme now both use permanently attached connectors and both lines are prone to leaking between hose and the permanent connector. I give rhinoflex a zero for leaking issues. I have 3 of their products. The old one where you have to tighten the ends from time to time and two leaking new ones with permanent ends. I seriously dislike the new ones with the permanent but leaky ends.